Having the season you hope for and actually having that season is the rarefied magic of sport. In December at the Pokljuka, Slovenia IBU World Cup, Egan scored a career-best sixth place in the pursuit while skiing the fastest time of day. The season has been a benchmark for the thirty-one year old originally from Cape Elizabeth, ME. She is the highest ranked North American women on the World Cup, currently positioned 25th overall. Reflective and cerebral, Egan took the time last Spring to gauge her future in the sport. It was this writer’s sense that after her final race at the PyeongChang Games Egan would pursue other opportunities — the grind, the up and down results taking their toll. Not having the season she hoped for, despite eternal optimism, had taken its course. 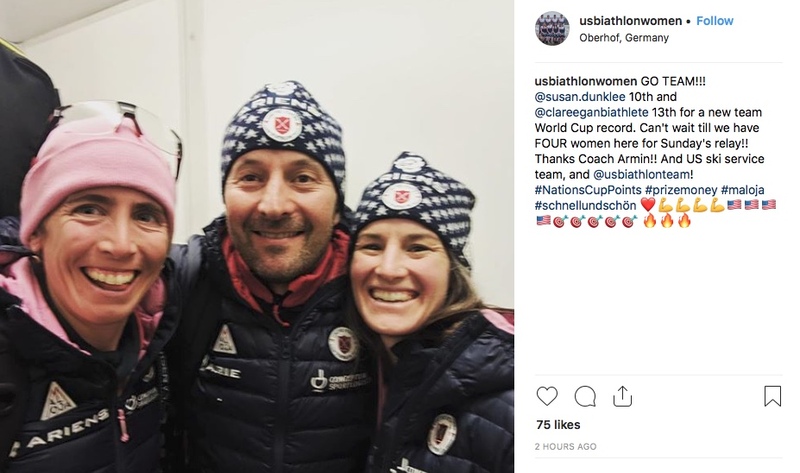 Egan’s commitment to another round of training and competitions were grounded in several notable changes at US Biathlon. Armin Auchentaller, a native of Italy, took over the coaching responsibilities for the U.S. women’s team. US Biathlon also changed their training paradigm to a camp focus rather than in-residence day to day training amongst the US Biathlon cohort. Based in Europe, Auchentaller and the women’s team gathered stateside for intermittent but intense windows of group training. Egan explained the model as two weeks in a camp, followed by a week of solo training and a week of rest and recovery. The nebulous “worked on stuff” was an atypical comment from Egan that she clarified. The “stuff” she worked on was remedying what she said was a lack of internalizing what she had been taught and learned. With the day-to-day team training model, Egan said she never could slow down to hard-wire new ideas and techniques. 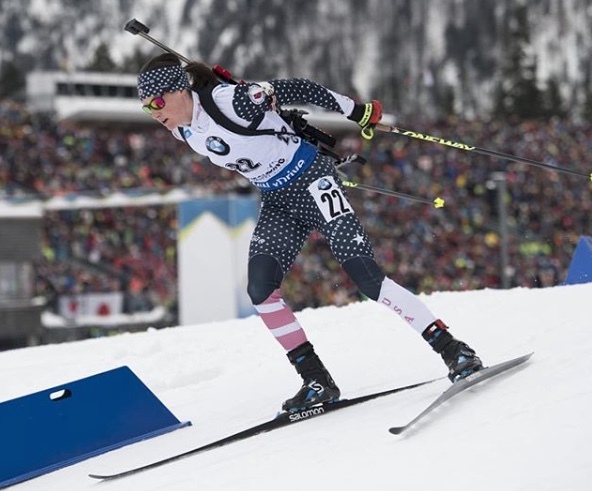 US Biathlon’s new system allowed Egan to decelerate and process what she was learning. And as is Egan, with her trait of drilling down into specifics, just as the conversation was drifting to a new topic she highlighted an ah-hah moment she had experienced. She relayed how in the past she had focused on meeting the minimum criteria – the game of doing just enough to make a championship team or bump up to the World Cup. If you are aiming high, and the hurdle is set low, an athlete runs the chance of doing just enough to clear the hurdle. Or, if things don’t align, just enough to trip the hurdle in an attempt to clear it. For now, Egan is focused well beyond the bare minimum and has embraced what she is calling a growth mindset where she imagines herself far surpassing the goal of barely grazing the hurdle. This is where the idea of envisioning the top goal takes on more critical import. Last April, the IBU’s headquarters were raided. As a result, then IBU President Anders Besseberg and Secretary General Nicole Resch eventually stepped down. For years the IBU had been battered by a reputation of cronyism and corruption. A sporting federation tasked with protecting athletes and promoting sport appeared more concerned with payoffs rather than the bottom line of fair competition and working on behalf of athletes. In March of last year, prior to the raid of the IBU headquarters in Austria, Egan was elected Chair of the IBU Athlete’s Committee. Her term will last until 2022 regardless of her competition status. “Dedicated to engagement and to the mobilization of the athlete community and the ensuring that athletes are at the core of what our organization is doing,” is how Egan summarized her task and mission as the Athlete Chair. What was not lost on Egan was the real impetus for change at the IBU: external examination and a blunt police raid. The IBU has begun the arduous process of rebuilding from within. And its press office has released statements promoting the rebuild. There’s this: “IBU Executive Board Takes Further Action to Strengthen Anti-Doping and Good Governance”; and IBU Hosts Stakeholders Focus Groups to Guide New Strategic Plan”; New IBU Ethics Commission Meets For First Time; and this Feb. 5 release, IBU Executive Board receive encouraging updates in ongoing reform process”. Egan cited past proactive stances from IBU athletes like signing petitions and making public statements about doping reforms and relocating the planned 2021 IBU World Championships away from Tyumen, Russia as small yet successful measures. And most recently, the IBU Athlete’s Committee sent an early January letter to the WADA Executive Committee and the IOC’s Athlete Committee regarding RUSADA’s non-compliance status. The athlete’s voice at the IBU has been further empowered under Egan’s leadership. In September at the IBU Congress, an athlete seat at the IBU Executive Board table was formally set aside for Egan as she serves as the current Chair of the IBU Athlete’s Committee. Along with that reform, the IBU has commissioned an external review into the details of the April police raid and connections to the IBU leadership. According to Egan, an athlete representative also serves on that oversight body. No surprise, Egan is in the driver’s seat helping forge that new path for the IBU. And she is committed to her own path and having the season she hoped for. Egan races next on the IBU World Cup this Thursday at the Soldier Hollow venue in Midway, Utah.